May 22, 2017—SDORC’s Sacramento lobbyist Kathy Lynch wrote and sent to Senate Appropriations Committee and other key individuals a letter from 14 land use organizations, including SDORC, opposing SB 249. 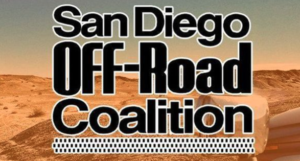 SB 249 is a proposed bill written by anti-access groups which would essentially gut the California OHV program, which is set to “sunset” this year in absence of a bill to reauthorize it. Click here for copy of letter.